Spice up your visit to the ancient Khmer Kingdom on a bike tour through Cambodia’s legendary temples. Exploring Angkor by bike is the best way to immerse yourself in the beautiful scenery and ancient history of the region. Price from: $398 - Book now! Welcome to Siem Reap, the provincial capital and gateway to the ancient Angkor temples. Designated a World Heritage Site by UNESCO, the Angkor Archaeological Park encompasses dozens of temple ruins including Bayon, Banteay Srei and the legendary Angkor Wat. Our driver and guide will meet you at the airport and take you to your hotel. Enjoy the evening at your leisure. We suggest a trip to Siem Reap’s downtown night market. Today you begin your biking adventure through the magnificent Angkor Archaeological Park. Our guide will meet you at your hotel and lead the way, cycling out of Siem Reap and into the Angkor complex. Start your tour with a visit to the legendary Angkor Wat - the largest Khmer temple and finest example of Angkorian art and architecture, then pedal to Angkor Thom’s imposing South Gate, topped with the four serenely smiling faces of Avalokiteshvara. Next, visit Bayon temple, the Elephant Terrace and the Terrace of the Leper King. Leaving Angkor Thom by the north gate, we bike to Preah Khan (Sacred Sword), one of Angkor’s largest temples, constructed in the 12th century by Jayavarman VII. Stop for a lunch of delicious Khmer cuisine before visiting the mysterious, jungle-entwined temple, Ta Prohm. Return the hotel around 3pm and enjoy some free time to relax and take a shower. At 4:30pm our driver and guide will meet you at the hotel and take you to Phnom Bakheng to enjoy the sunset, casting the surrounding temple-dotted jungle in golden radiance. Enjoy breakfast at the hotel then set off on a drive to the tranquil countryside around Kulen Mountain - the Khmer Empire’s capital in the early 9th century. Here we visit countless ancient temples, the River of 1000 Lingas, a reclining Buddha and cascading waterfall. After lunch drive to Banteay Srei, home to Angkor’s finest stone carvings. Today we visit some of the oldest temples in the Angkor complex. After breakfast bike out of town to the ancient capital of King Indravarman I (877-889), now referred to as the Rolous Group and known as the birthplace of classical Khmer art and architecture. Stop for lunch at the local village before biking back to Siem Reap (total biking distance: 26km). 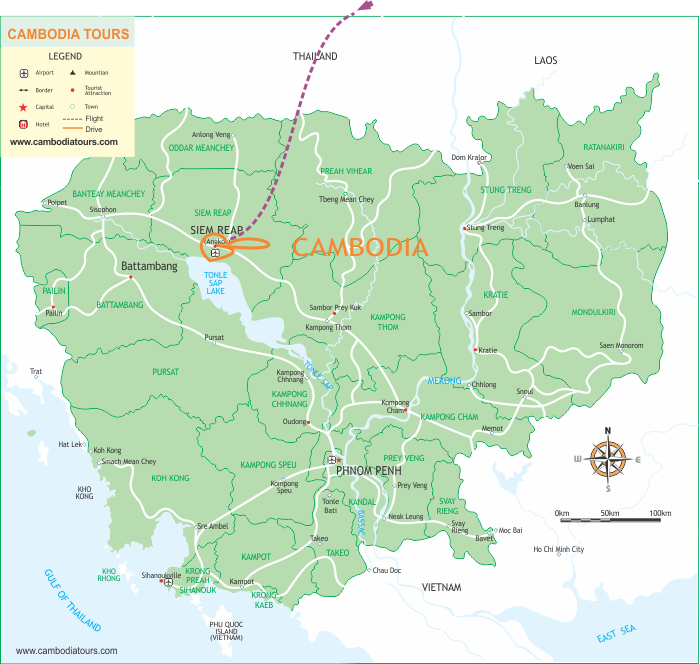 In the late afternoon we will drive to Kampong Pluk and board a boat to tour Tonle Sap Lake, Cambodia’s largest natural body of water. Visit the nearby floating village and learn about local life on the water. Return to Siem Reap in the evening. Have breakfast at the hotel then drive to the airport to catch your departure flight home. Bon voyage! What level of fitness or distance do you need to do the 5 day tour? Thanks for your kind question. Please be informed that the biking distance is 6 - 12km on day 2 and 20 - 26km on day 4. The route is very easy and our guide accompanies you through the trip, you can get on car whenever you feel tired and want to rest. Regular physical exercise helps you manage your health to enjoy the biking tour at its best though this program is easy.